Well then we are back to zero I don't want to risk breaking the rims. Since the only reason for splitting is to paint the star and not the bolts i will might as well get the bolts off, paint it and then putt them back on. Will see thought...I will let you know of my actions as soon as i decide! how did you all of you remove the wheel from the rims? all of you have second set of wheels? 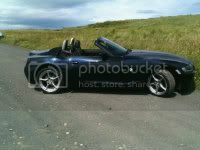 RJS-Z4 wrote: It's not having a spare, it's being able to get the snapped on out, trust me. Where did you buy 20 bolts from? Or did you buy a wheel and remove them? I can drill and tap them out for you. Long drive mind!!! As a matter of interest what sort of drill and bit do you use? Has anyone had a refurb without splitting? Been quoted £120 for all 4- our garage removes the tyres off there wheels so I've seen a lot of there work and on the most part it's great, but they dont get involved in splitting wheels, am I better off spending more and getting the split? I just bought set of 108, needs reconditioning. Project wheels as we say. I have been thinking this kind of process, please correct me if something is wrong or stupid. Wheels are already in parts, 80 bolts, 4 alloys and 4 stars. - Then i take wheels to the tyreshop and they check if rims are round and okay. - If alloys need painting too, i prep those and also take to the paintshop. Same colour + lacquer (only visible side, behind spokes). - I am still thinking, lips polished or just painted with silver + lacquer.. So basicly, maybe i will get whole wheels painted+stars too with that bmw original colour. It will be not the cheapest option ..
Or.. lips polished + lacquer? - I assembly wheels using loctite threadlocker.. what is torque for bolts? What you say or recommend? 2005 2.0 Z4 bright red ZHP 108's,M sport leather,aux in. Currently i dont have wheels, i am waiting next week those arrive. Photos which i have, those are from seller. I update next week when have wheels and those are cleaned. 1. If i decide to paint complete wheels , do i have to protect that contact area where star meets the alloy itself , so there should be not any paint? 2. Is there any trick how i can prep those bolt holes for paintwork, get old paint off..
3. Should i put some silicone or sealang between stars and wheels to avoid water corrosion damage in the future?